Garden Tours, Flower Shows, Festivals, Celebrations! Boston's spring flowers perfume the air as they burst into bloom in April. The exuberant display of blossoms intensifies during May and June, and continues in more subdued hues until frost. 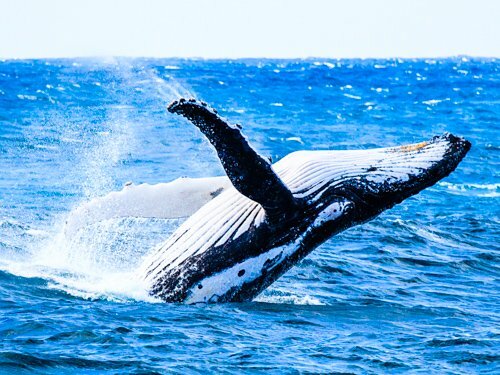 Look at the following photos to get a preview of what you can see if you visit Boston during spring and early summer. 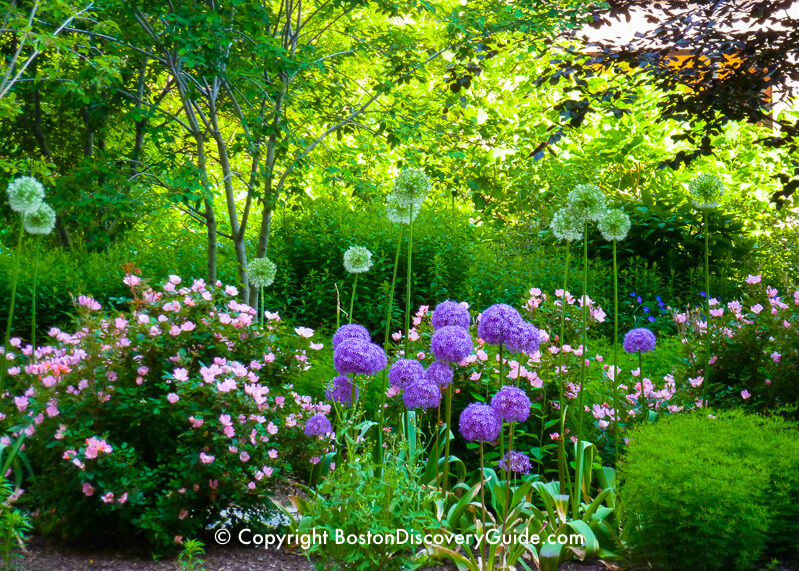 Then, check out our recommendations for the best Boston locations for self-guided spring flower garden tours, plus everything you need to know about Boston garden shows, garden tours, festivals, and celebrations. Art in Bloom - The Museum of Fine Arts transforms its galleries with exuberant flower arrangements based on the museum's masterpieces. 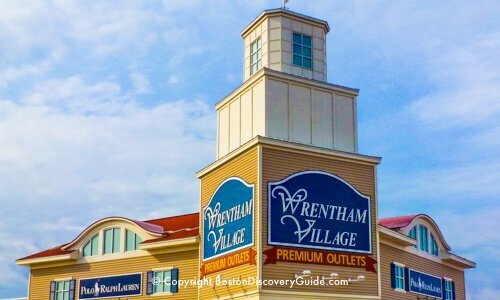 Free museum admission if you have a Boston discount card. Hidden Gardens of Beacon Hill Tour - For one day only, residents of Beacon Hill invite visitors behind their high brick walls, where unique hidden gardens delight their owners. Lilac Sunday - What better way to spend Mother's Day than inhaling the exquisite perfume created by the Arnold Arboretum's extensive lilac collection, usually at its peak of bloom. Boston Flower and Garden Show - Filled with magnificent display gardens, the Boston Garden Show held in March reminds us that spring really is right around the corner. You'll see dates for most of the flower photos on this page - but keep in mind that bloom times differ a little each year, and sometimes a lot. Roses - the classic sign of summer! 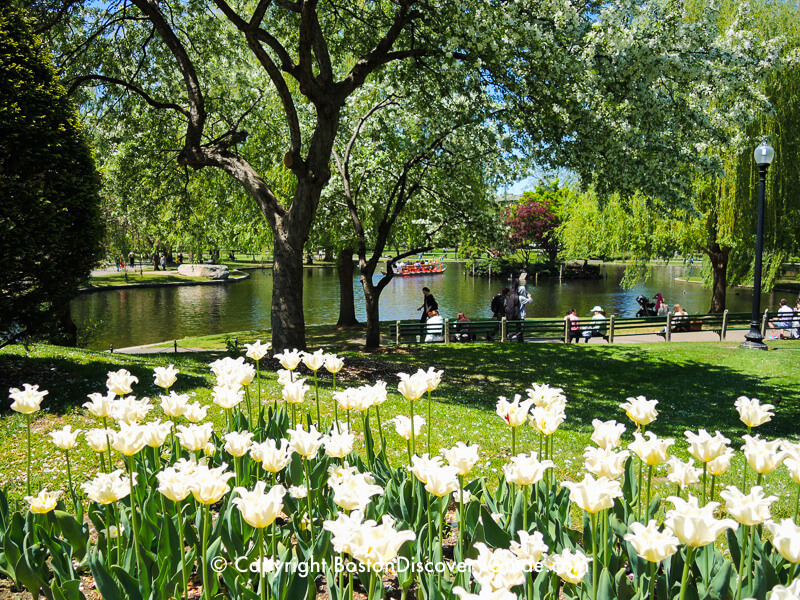 Although you can see plenty of blooming flowers throughout Boston during April, May, and early June, several neighborhoods and gardens offer especially gorgeous viewing. 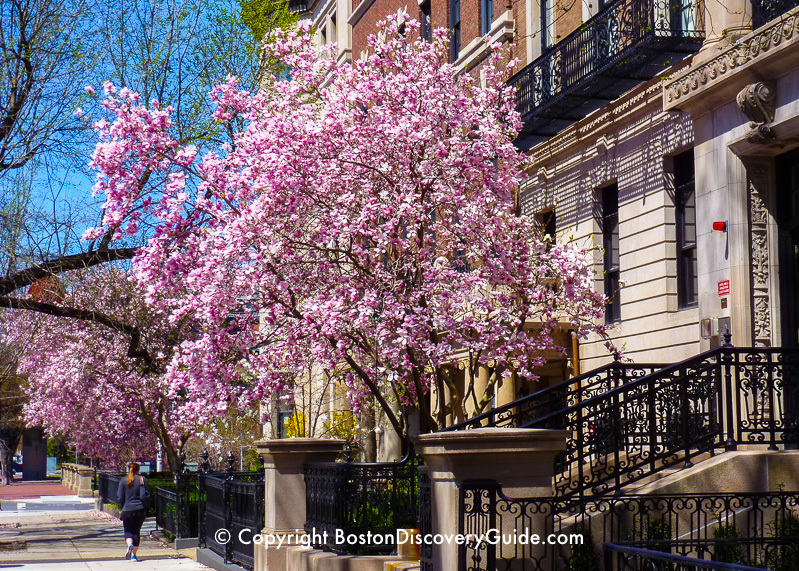 Back Bay tops our list for spectacular displays of spring flowers for one reason: the dazzling magnolia trees, especially along Commonwealth Ave, Marlborough Street, and Beacon Street. You'll see huge saucer magnolias in hues ranging from pearly pink to fuchsia to deep purple mixed in with ethereal star magnolias, and other types of flowering magnolias as well. 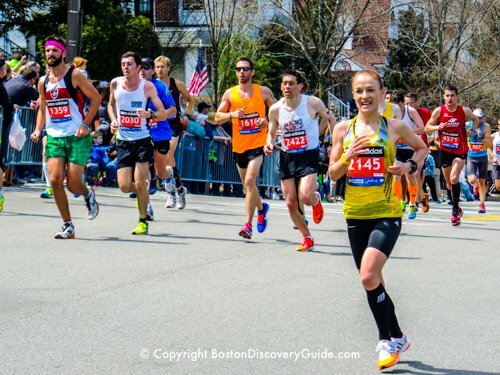 Buds start opening in early April, and the display is well underway by Boston Marathon weekend. When the weather cooperates (no early searing heat, no thunderstorms with driving hail, no tearing winds), you can still see magnolias in bloom through early May. The front gardens of many Victorian brownstones in Back Bay feature plenty of daffodils, tulips, other spring-flowering bulbs such as giant alliums, and perennials. 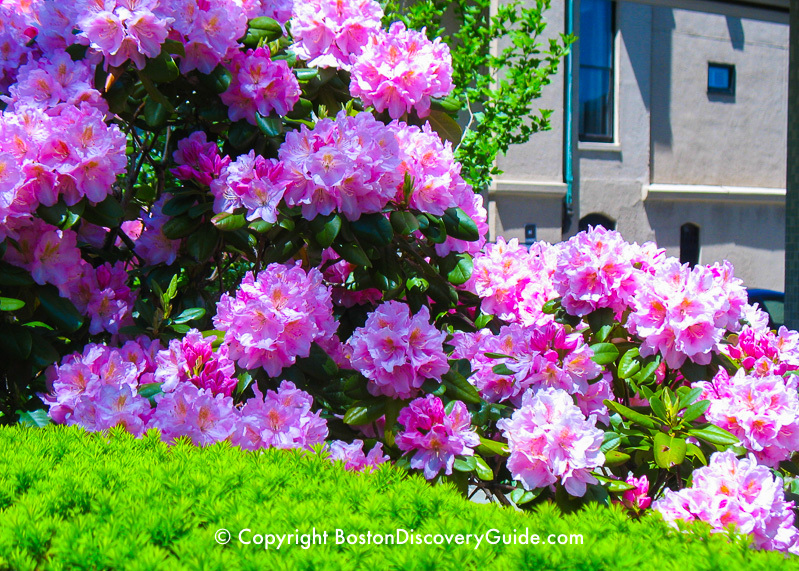 Even more spectacular, though, are the rhododendrons, peonies, and early roses appearing throughout Back Bay in May and into June. 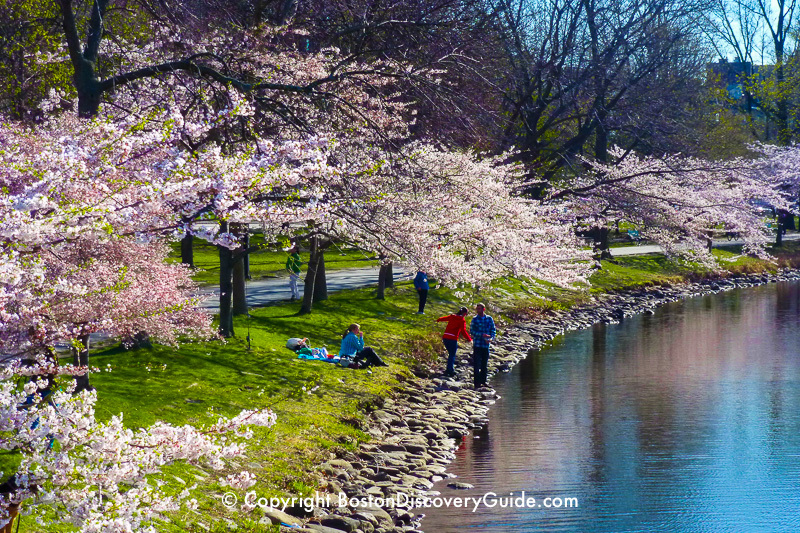 Cherry trees planted along Boston's Esplanade burst into bloom in April, and turn this lovely park next to the Charles River into an enchanted garden. Sadly, they don't last long but are worth the effort to see. Every year is different, but mid-to-late April is usually a good bet. 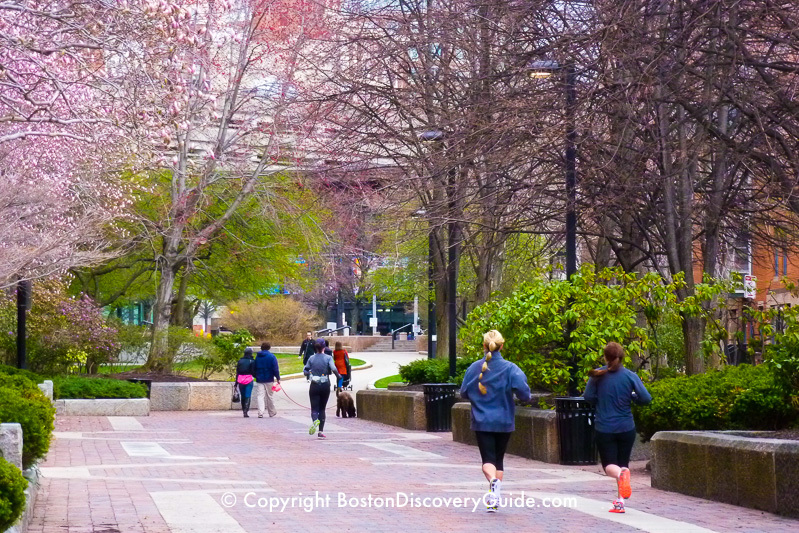 You'll find the highest concentration of cherry trees in the section of the Esplanade bordering Back Bay, roughly between the Fiedler Footbridge (off Arlington Street) and the Mass Ave access ramp. Most magnificent in June, with blooms continuing from May through Frost. 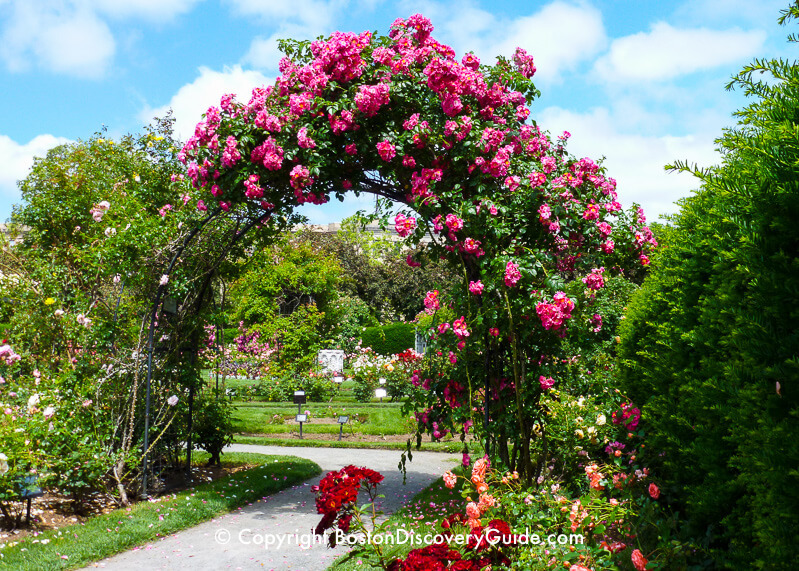 More about the Kelleher Rose Garden located near the Victory Gardens in Boston's Fenway neighborhood, just a couple of blocks from Fenway Park. 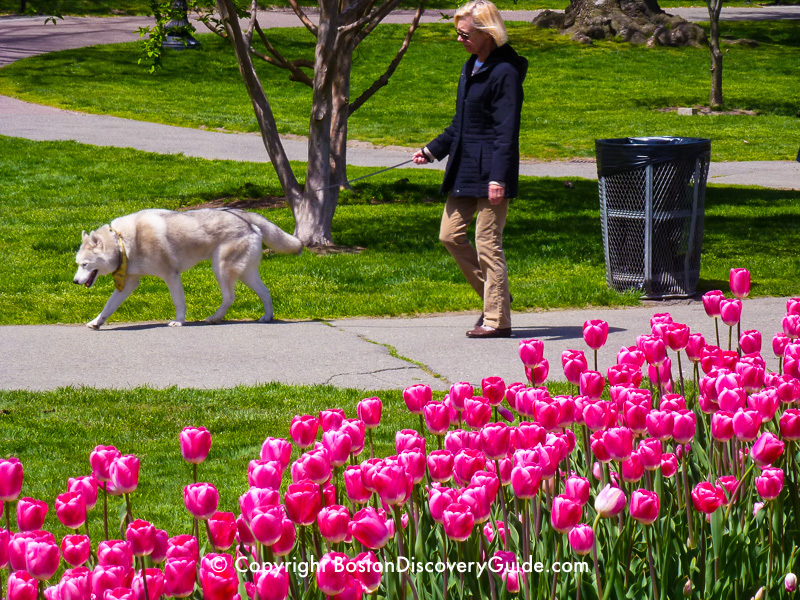 Located next to Back Bay (check the Boston Sightseeing Map to quickly see locations of all these neighborhoods), Boston's Victorian-era Public Garden features winding paths and lots of small but formal planting areas. Spring flowers on display vary somewhat each year, but always include tulips and other spring-flowering bulbs and annuals such as pansies during April and May. In keeping with the Victorian character, you'll usually see lots of unusual sub-tropical types of plants here as well - apparently these were popular during Victorian times. In addition to flowers, spring foliage in the Public Garden is also spectacular, especially the chartreuse-colored weeping willows surrounding the lagoon. The best way to enjoy close-up views of the willow foliage is by taking a swan boat ride. The swan boats return in mid-April, so the timing is perfect. Much of the South End is shady, and gardens tend to be tiny - but that doesn't stop South Enders from planting spectacular container gardens. Walk down Waltham Street and the side streets intersecting with it, and you'll see some wonderful examples. Combine this stroll with a visit to SoWa Open Markets, opening in early May, for a perfect Sunday afternoon in this trendy Boston neighborhood. The Southwest Corridor Park, lined with community gardens, is another South End location where you can count on seeing plenty of brilliant spring flower displays. From Back Bay station, walk down Dartmouth Street going south. Almost immediately, you'll see the Southwest Corridor to your right. For the best views of South End gardens, go on the annual South End Garden Tour. 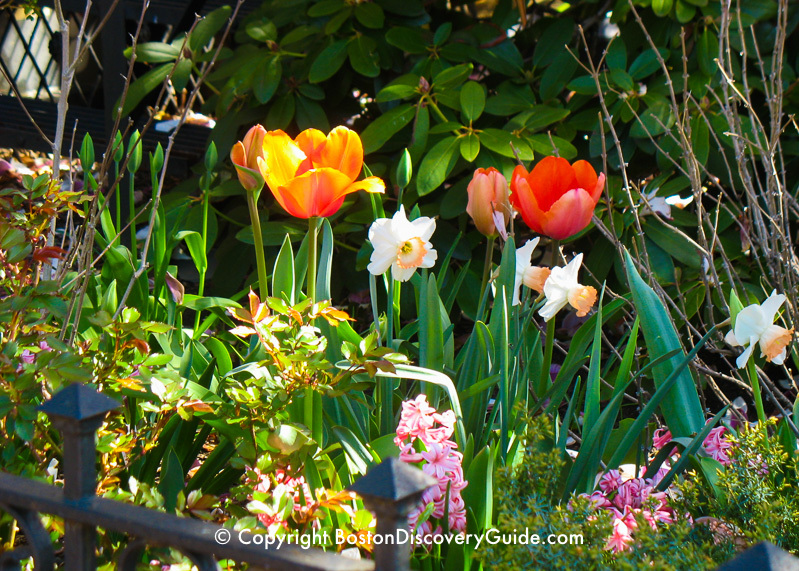 The garden sections of the Rose Kennedy Greenway overflow with lovely spring flowers. Across from the North End, you'll find a broad stretch of daffodils blooming from about mid-April until early May, when daylilies take over. That's where the gorgeous yellow magnolia trees shown in the photo gallery are located. 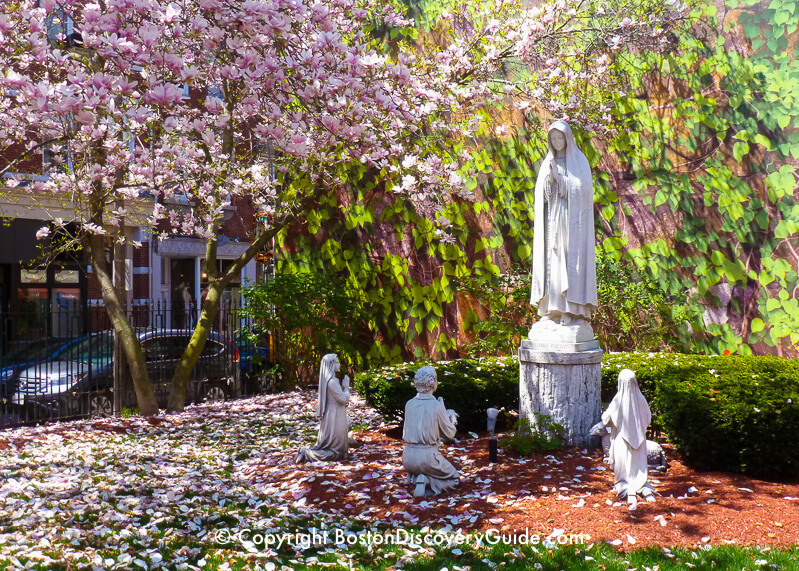 If you're visiting in late May or early June, the best place to begin your Greenway tour is not on the Greenway itself, but a few steps away at the Rose Kennedy Memorial Garden, located near the southwestern edge of Christopher Columbus Park just north of the Boston Marriott Long Wharf Hotel. Roses in this lovely oasis bloom from late May through frost, with especially spectacular flowers during June. In April, look for spectacular cherry trees in full bloom tucked in pockets between the North End's densely spaced buildings. The courtyard in front of Saint Leonard's Church on Hanover Street is especially beautiful when the trees are in full bloom.